Our selection of the best free graphic design software available. Being a graphic designer isn't exactly the cheapest profession there is. While you might not necessarily need to study formally to become a designer, you will need to know your way around graphic design software, and that can be expensive. But the good news is that there are more options than ever around, and many of them are free. While free graphic design software won't give you as rich an array of features as software such as Adobe's CC (get Adobe Creative Cloud here) or Affinity's software, you may find that with the right combination of the tools below, you can do almost any design job. And even if you have paid for some software, that doesn't mean you can't combine it with other free tools. The learning curve of the free, more basic graphic design tools is also often a lot gentler than trying to get to grips with the complex software and menus of the subscription-based or more expensive packages. With all that in mind, below are our best free graphic design tools – divided into software for creating vector art, creating and editing images, creating data visualisations and other useful tools you might like – use the menu above to navigate to the section you want. Gravit Designer is a full-featured vector design app from the company behind Corel Draw. It's suitable for all sorts of design jobs, from screen, app and icon designs to presentations, illustration and animation. With a clean and intuitive interface that adjusts itself as you need it, this free graphic design software packs a wealth of tools for creating detailed and beautiful vector imagery, including non-destructive booleans, a knife tool and path graphs, plus multiple fills and blending modes, and a powerful text engine. You can use Gravit Designer online or download a copy to your computer; note that you automatically start out on a (free) trial of Gravit Designer Pro when you sign up, and once your trial is over you transition to the free version, but lose the Pro features – unless you pay for a subscription of course. However, Gravit Designer's free version is still excellent. You can export as PDF, SVG or bitmap, and you get access to the Gravit Cloud service that enables you to get to your work wherever you are. See the full comparison between the Pro and free versions here. Available both as a browser-based web app and as a stand-alone desktop app, Vectr is a free editor for creating 2D vector graphics. With all the vector features you'd expect, plus a wealth of options for using filters, shadows and fonts, it's versatile enough for day-to-day design tasks. Its live collaboration and synchronisation options are particularly handy, as they essentially enable anyone to watch you design, live, meaning it's really easy to create in tandem or send feedback. This is a genuine alternative to Adobe Illustrator CC. If you're looking to quickly output SVG or edit an existing SVG file, there are a few online editors that will do the job just as well as Adobe Illustrator. SVG (scalable vector graphics) is an open format that allows you to reproduce your Vector drawings programmatically, and one of the nicest projects is SVG-Edit. The standard – albeit basic – toolset of every vector-image editor is here, and although it's limited to the SVG format, it's surprisingly capable. Note that if you're not familiar with code, this option probably isn't for you. As with many of the free options available, Inkscape focuses on the SVG format as its primary file format. This highly capable editor has a very good SVG integration, supporting many of the more advanced features that aren't always available in other apps – such as alpha blending, cloned objects and markers. Full support for different colour modes means this is a viable alternative to Illustrator for both print and web design, and although the interface is somewhat simpler than Illustrator, it's still possible to achieve extremely sophisticated artwork. Of particular note is the ability to trace bitmap images, support for variable width strokes and native import of Illustrator files. It seems harsh to place Canva under the 'Image Editing Software' heading because it does so much more. Canva is a photo editor, colour palette tool, font combination picker, learning resource, and photo collage maker, and it even features a dedicated infographic maker with hundreds of free design elements and fonts at your fingertips. It's really more of a full graphic design suite than a photo editor, and while it comes some way short of offering the breadth of abilities of Adobe Creative Cloud, its simplicity, variety of useful tools, and inspirational learning assets make Canva a hit. You can use Canva in the browser for the full experience, but most tools are available for both Android and iOS. RawTherapee enables users to correct distortion, boost colours, recover details and much more, meaning users can make tweaks to their photos until they're looking exactly how they want. This free, open-source software also speeds up your workflow by allowing you to batch process images. You can also send images to other software, such as GIMP, if you wish to. If you're on a Windows PC and need a decent set of image editing tools without Photoshop's price tag or GIMP's immense toolset, Photo Pos Pro should hit the spot. Built with image enhancement and editing in mind, it's perfect for typical photo editing tasks such as fixing contrast, lighting and saturation, but it'll also stretch to more advanced techniques. It boasts an extremely user-friendly interface as well as an in-depth help system to get you started, and if you want to expand its tools to fit your needs, there are plenty of expansions and plugins available. Designed with the VFX industry and concept artists, illustrators, matte and texture artists in mind, Krita is a free and open source painting tool that's been in development since 1999. It comes with a full set of brushes suitable for all manner of work, and there's a whole host of plugins available, from advanced filters to painting assistants for perspective work. Notable features include brush stabilisers to smooth out any shaky lines, a wrap-around mode for creating seamless textures and patterns, and a pop-up palette for quick colour-picking. 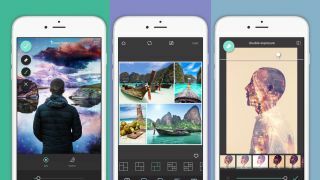 Free graphic design software Pixlr claims to be 'the most popular online photo editor in the world'. It boasts over two million combinations of free filters, overlays and borders, and lets you do all the main things you'd expect from a photo editor, from cropping and resizing to removing red-eye and whitening teeth. If you're used to using Photoshop, then you'll find Pixlr's user interface easy to pick up, as it's very similar. This free app is available in both iOS and Android varieties. Note that the app does offer in-app purchases – you can pay $1.99 to remove the ads, for example, and you also pay extra for things such as borders and stickers. Paint.NET is a Windows-based alternative to the Paint editor that Microsoft shipped with versions of Windows. Don't let that put you off, though, as it's surprisingly capable, useful and free graphic design software. The focus is on ease of use, and there's a definite tendency towards photo editing rather than artistic creation. That said, there are a range of special effects available, allowing you to easily create fake perspective, blend and push pixels around the canvas, tile and repeat selections, and so on. A good range of selection tools, support for layers, and adjustments such as curves and brightness/contrast mean that Paint.NET is a great alternative to Photoshop for photo editing, especially if you can do without some of the more recent additions to Photoshop's toolset. Sumo Paint is a highly capable browser-based image editor. All the standard features you'd expect from a desktop tool are present and correct (and by buying the Pro version you can install a desktop version of the app if you prefer). You need the Adobe Flash Player to use this tool, so you're not going be using Sumo Paint on your iPad. That said, it's lightweight and quick to load, and the free version is very usable. The standard range of tools and adjustments you'd expect are all included. Brushes, pencils, shapes, text, cloning, gradients and so on are all quickly accessed from the Photoshop-esque floating toolbar. It can also open saved documents from your hard drive, making Sumo Paint a perfectly viable option for editing and re-editing. Open-source free graphic design software that debuted on Unix-based platforms, GIMP stands for GNU Image Manipulation Program. Today it's available in versions for Linux, Windows and Mac. GIMP's interface differs somewhat from Photoshop, but a version of GIMP is available that mimics Adobe's look and feel, making it easier to migrate over if you're ditching Photoshop. The full suite of tools is available here – everything you're accustomed to is within easy reach, including painting tools, colour correction, cloning, selection and enhancement. The team that oversees development has worked hard to ensure compatibility too, so you'll be able to work with all the popular file formats without any trouble at all. You'll also find a very capable file manager built in, along similar lines to Adobe's Bridge. For getting your first foothold in the world of 3D, it's hard to go wrong with SketchUp, and its free version, Sketchup Free, is an ideal starting point. It provides a friendly and forgiving introduction to building stuff in 3D, starting you off by simply drawing lines and shapes that you can then push and pull around to turn them into 3D forms. If you need a bit of inspiration, you can search the SketchUp 3D Warehouse's immense library of models and download them for free. Daz Studio is a 3D figure customisation, posing and animation tool that enables artists of all skill levels to creating digital art using virtual people, animals, props, vehicles, accessories and environments. With Daz Studio, you can create custom 3D characters and avatars, design virtual environments, produce graphic design elements and much more. There's also a handy table that shows you what this free tool offers in comparison to its paid alternatives (scroll down to the comparison table here). Also from Daz 3D is Hexagon, a free 3D modelling tool. Hexagon includes everything you need to create detailed 3D models ready for final render. Features include Daz Studio 3D Bridge, sculpted primitives, freehand modelling brushes, micro-displacement modelling tools, comprehensive UV-mapping modules, advanced 3D paint, and instant ambient occlusion. Use it alongside Daz Studio for a complete 3D suite, for free – ideal for those just getting started with 3D. If you're serious about 3D but struggling to afford software, then you're in luck. Blender is a free, open source 3D content creation suite, available for all major operating systems. Started by Blender Foundation founder Ton Roosendaal back in 2002, Blender is now largest open source tool for 3D creation. Its makers are constantly working on its development, but you can pretty much do anything 3D related with this software, including modelling, texturing, animation, rendering and compositing. If you're interested in the art of digital sculpting, check out 3D software Sculptris from Pixologic. Perfect for all skill levels, the software is a great starting point for users new to the discipline, while more experienced CG artists will find the it a quick and easy way to realise concepts. Sculptris is based on Pixologic's ZBrush, the most widely-used digital sculpting application in today's market. So, when you're ready to move on to the next level of detailing, skills learned in Sculptris can be directly translated into ZBrush. Houdini is a 3D animation and visual effects tool, used widely throughout the media industry for film, broadcast, entertainment and visualisation. And its cheapest version costs just a little under $2,000. But the makers of the programme – SideFX – are a good bunch and, knowing that cost can be an issue, offer an Apprentice version for free. With this you can access all the features of the full version in order to develop your skills and work on personal projects. The programme is purely for use non-commercial and learning purposes. Google Charts tools are powerful, simple to use, and free. You can choose from a variety of charts and configure an extensive set of options to perfectly match the look and feel of your website. By connecting your data in real time, Google Charts is the perfect infographic generator for your website (see our best infographics here). It was only a matter of time before an infographic resume generator turned up. With this you can visualise your resume in one click and also take a look at previous examples and resume templates. Enabling people to express their professional accomplishments in a simple yet compelling personal visualisation, we think this is an option worth exploring. Infogram is a great free tool that offers access to a wide variety of graphs, charts and maps as well as the ability to upload pictures and videos to create cool infographics. The data upon which the infographics are based can be found in an Excel-style spreadsheet, which the user can easily edit and see the results change in real time. When you're happy with your infographic you can publish it to the Infogram website for all to enjoy, embed it in to your own website or share it via social media. Made by the people behind Gravit Design, and sharing the same engine, Klex is an easy-to-learn and accessible tool for anyone who wants to create impressive graphics in just a few clicks. While obviously not aimed at pro designers, it's the perfect tool for anyone who wants to quickly bang out memorable designs. There's a plethora of ready made templates to choose from, plus thousands of assets and a great selection of effects and filters, as well as customisation options and a load of fonts and text assets. The Google Web Fonts project – renamed Google Fonts – is an extensive catalogue of free and open source designer web fonts, presented in an intuitive directory. The initiative invites users to explore and test fonts in more than 135 languages, and create their own customised collections of font families. With millions of views each month, online creative community Behance is a key resource for artists of all disciplines. It's a fantastic way to see what your peers are up to, as well as finding new work and creative inspiration from top web and graphic designers, agencies and illustrators. There are a whole lot of designers who don't have their own blog, but Wordpress is a great way to showcase your fantastic work, get recognition in your industry, earn extra income and get new clients. Don't believe us? See our examples of WordPress websites. WordPress is the most popular platform for blogging, and while it can be a little fiddly to set up, there's lots of helpful information online to get you going, including these 40 brilliant WordPress tutorials. Dribbble enables designers to share their creations easily, and is a good source of inspiration as well as a great way to promote your own work.